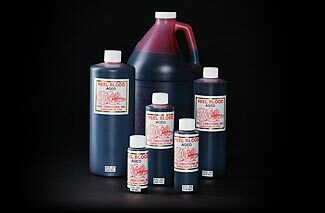 REEL BLOOD Aged Formula is the brownish color of blood exposed to the air and starting to dry. WARNING: Not to be ingested. Use of REEL Aged Blood in the mouth is OK provided it is spit out and the mouth rinsed with water. Do not use in eyes or any other open orifices of the body. Not for body contact recirculation systems (i.e. showers) - bacteria contamination will occur. Once used, discard.